It’s November 1, and that means it’s time for National Novel Writing Month. Yes, I’m participating again this year. 50,000 words in 30 days. I have never completed this task, but that’s because I can’t seem to turn off that internal editor. Whether this year is my year to finish or not, I’m committed and ready to have a crazy month of fun. In case any of you book bloggers are joining in the fun, I’m pavcrawphan over on the NaNo site; here’s the link. I haven’t written anything yet, but I hope to find some time today after laundry is done and other chores are completed. Who knows, I may start writing sooner rather than later. I saw This Is It, the Michael Jackson documentary, this weekend and my review article is up over at D.C. Literature Examiner, if you are interested. I really enjoyed the movie. 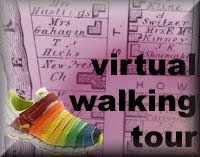 Rebecca at Just One More Page emailed me to let me know that my Virtual Walking Tour post on her blog is up and ready for commenting. Interested?? Check out my stop here.